Are you aware of the language your body expresses? It's effect on your relationships and experience? Your flesh and blood is your diary. The emotional stories of your life are recorded on your body's cells. We walk around in these legs, take painstaking steps to get under the skins of those closest to us, yet spend minimal time, if any, getting under our very own. Instead we constrict, often unconsciously, trapping emotions, blocking a natural biological flow of information. Compressing our nerves, tissues, and blood flow ignites inflammation and pain, dulls sensitivity and pleasure, and recycles tired patterns. How can we experience the intimacy we crave with someone else, while we are dissociated from our own body? 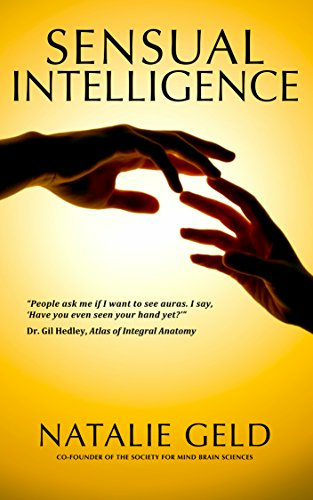 In this introduction to your Sensual Intelligence, Natalie Geld, co-founder of the Society for Mind Brain Sciences, demonstrates how to experience your body from within on an exquisite hands on, detailed tour from head to toe. Explore surprising and fun ways to unlock vital energy, to enliven sensitivity to heal, to feel pleasure, and to feel love. Benefit from breakthroughs in consciousness science and human anatomy. Natalie shares her provocative conversations with its leaders to reveal the stunning interdependence of our mind-body networks -- a highly concerted effort that we are an indelible part of. Feel good in this skin you're in. Listen to your body and begin to speak its language - the quality of your communication matters. A must read for anyone with a body!